The K2 Bright Lite is a updated version of the now discontinued Lunatique. Just like the Lunatique the Bright Lite is flat a bit past the bindings and then rockers up a little sooner than their flatline tech, jib rocker tech and catch free tech. It’s called their all mountain rocker. 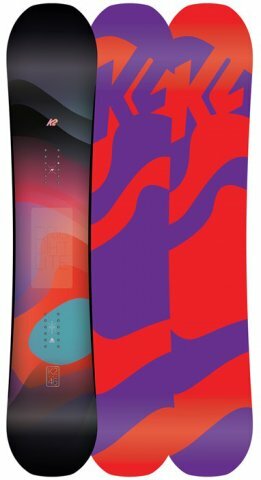 It has a good an all conditions ride that offers catch free stability and float in powder. The 2014 K2 Bright Lite changed up the ride a bit by blunting out the nose/tail. It looks more like a freestyle board but still has a great all mountain to all mountain freestyle ride that many entry level riders will appreciate. The 2015 is pretty much the same as the 2014. On Snow Feel: Nice and stable between the feet. There is flat a little bit past the bindings that makes it stable but not catchy. This is a great board for one footing and flat basing off the chair. Powder: This hybrid shape with flat to rocker combined with the set back makes it perfect for any one looking to set it back for a surfy ride or keep it centered for a more skate/freestyle/ride it switch kind of feel. The nose/tail don’t want to sink very easy so this is good even if you ride in thick snow. Turn Initiation and Carving: The K2 Bright Lite is easy to turn quickly edge to edge and isn’t bad making medium to wide turns but it’s not an ideal carver. It holds an edge (if the snow isn’t too hard) into a pretty hard carve but it doesn’t spring out of the turn. Speed: This isn’t a bomber but it’s stable as you pick up speed. Great board for a beginner/intermediate. Uneven Terrain: Pretty good dealing with emerging moguls on a crowded saturday. Edge Hold: Doesn’t quite have the grip that some boards with a little extra going on in the side cut do but it’s still not bad. Just kind of right in the middle so if you ride in medium to good conditions you will love this board. If it’s more hard and icy you might want something with a little more mustard on the side cut. Flex: Nice medium soft flex that is easy to butter, press and play around with. Very forgiving and fun for those that want a balanced freestyle/mountain board. Switch: With the stance centered it’s almost the same either direction. Jibbing: Not a bad jib board if you want to go into the jib park. Pipe: For a flat to rocker board this isn’t bad in the pipe but it’s no dedicated pipe board either. We generally prefer something with some camber in it. Jumps: There isn’t much pop out of a turn but the flat past the bindings makes it easy to ollie and there is a nice pop when it comes to generating your own air. It’s not a bad board in the jump park either and will be fun to learn on. The pop is not completely lifeless but there are many boards that have more spring. So if you can deal with lesser pop you’ll get a lot more when it comes to stability and easy powder riding. It is not as fun when it comes to carving but it’s still pretty fun. This is a great do anything board and one of the best in it’s price range. We are big fans of K2’s All terrain rocker and think it’s one of the better flat/rocker designs out there. The new tweekend tech isn’t bad either but the ride is pretty similar to the old Lunatique. We try to get as many images of the K2 Bright Lite, but forgive us if they're not all there.